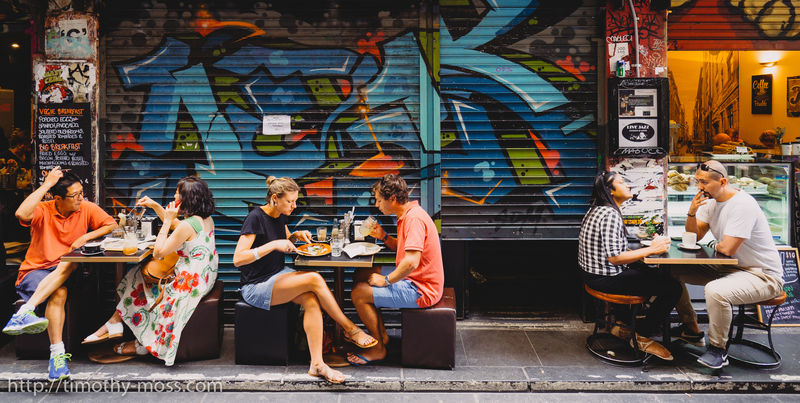 Melbourne is known for its network of laneways, each of which seems to house some hidden treasures, ranging from tiny galleries and bars, through to cafes and coffee places of every cultural persuasion. People gather, pressed together like sardines sometimes, and they eat, drink, talk, laugh, and every other thing. Love this shot 🙂 I walk through Degraves St and Centre Place every morning to get to work – I could get off at a station closer to work and skip the extra 15-20min walk, but it’s so worth it!